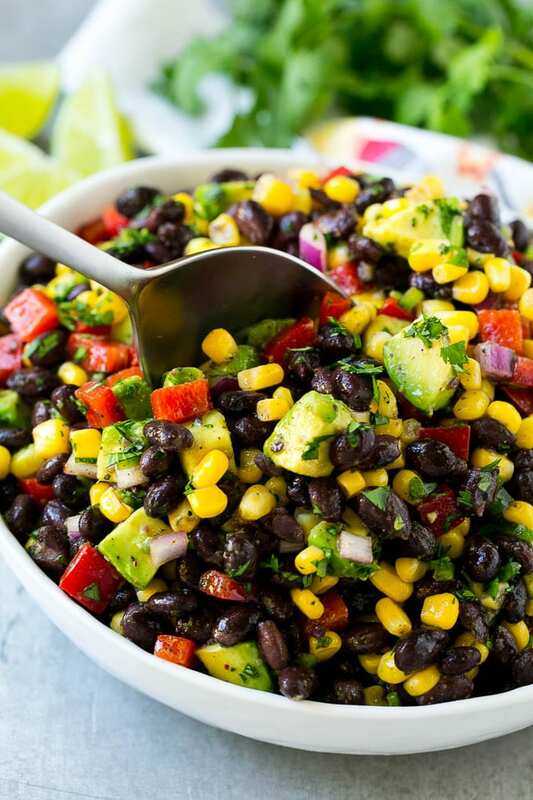 This black bean and corn salad is a fresh mix of black beans, corn, red peppers, jalapeno and avocado, all tossed in a zesty cilantro lime dressing. An easy salad that’s the perfect side dish for any meal! Black bean salad is full of different flavors and textures, and makes a great side dish. You can even serve it as a dip for chips or as a topping for grilled meats or fish. I love this time of year when all the fresh foods come into season. 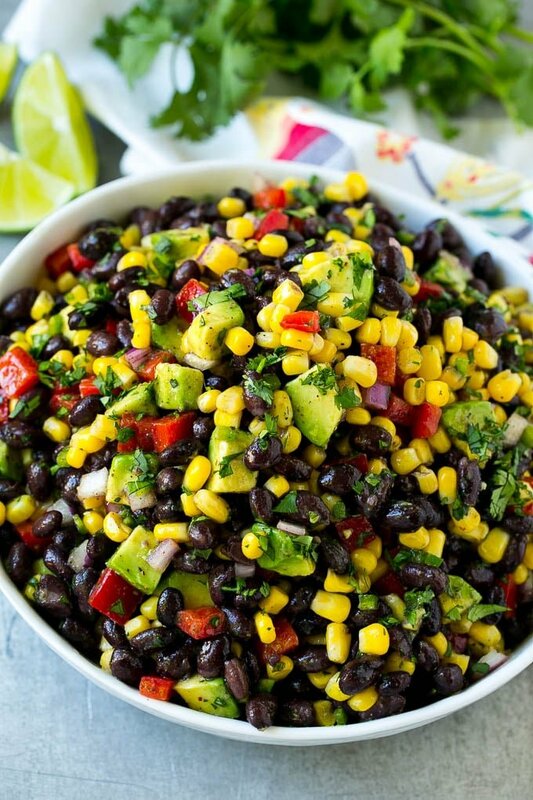 One of my favorite dishes to make is this black bean and corn salad. With fresh avocados, red peppers, corn, and jalapeno, it feels like a veggie lover’s dream. HOW DO YOU MAKE BLACK BEAN AND CORN SALAD? This black bean salad is as easy as they come. 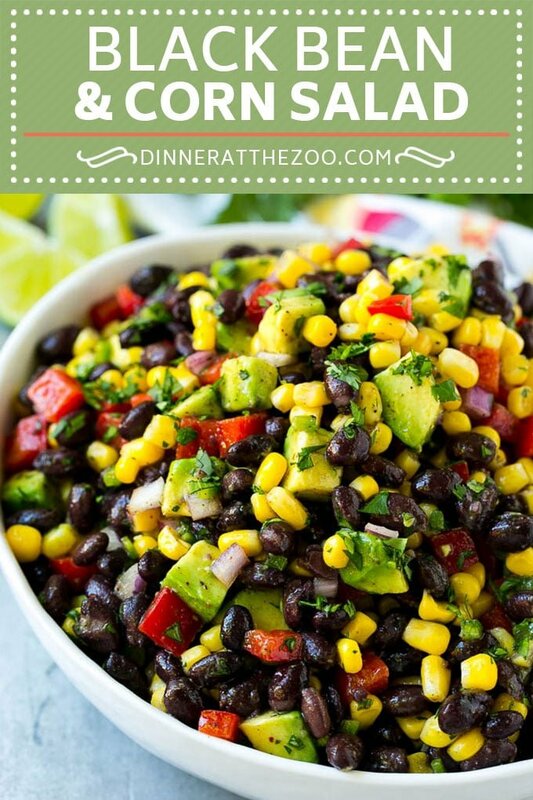 In one bowl, mix your black beans, corn, red peppers, and avocado. In a secondary bowl, whisk together the ingredients for the zesty cilantro lime dressing and combine for delicious side dish or appetizer. You can make this black bean salad up to a day in advance. However, you’ll want to leave the avocado out initially, and then add it in with everything else once you’re ready to serve. If you leave the avocados to stew overnight in the black bean and corn salad, they’ll turn brown and nobody wants that. This recipe contains one jalapeno. If you’re looking for a mild taste, remove the jalapeno seeds and ribs before you mince the pepper. If you love your spice, leave the seeds and ribs in and enjoy that extra kick of heat! HOW DO YOU MAKE BLACK BEAN AND CORN SALSA? It’s actually pretty easy to convert black bean and corn salad into salsa. It’s all the same ingredients, you’ll just want to chop them up finely. Whether turned into a salsa or left as is, it’s delicious served on the top of tacos, with tortilla chips, or over a piece of grilled chicken. 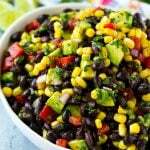 IS BLACK BEAN AND CORN SALAD VEGETARIAN? My version definitely is! In fact, this dish specifically, is perfect as a vegetarian main dish. If you remove the honey, it’s also a vegan dish. 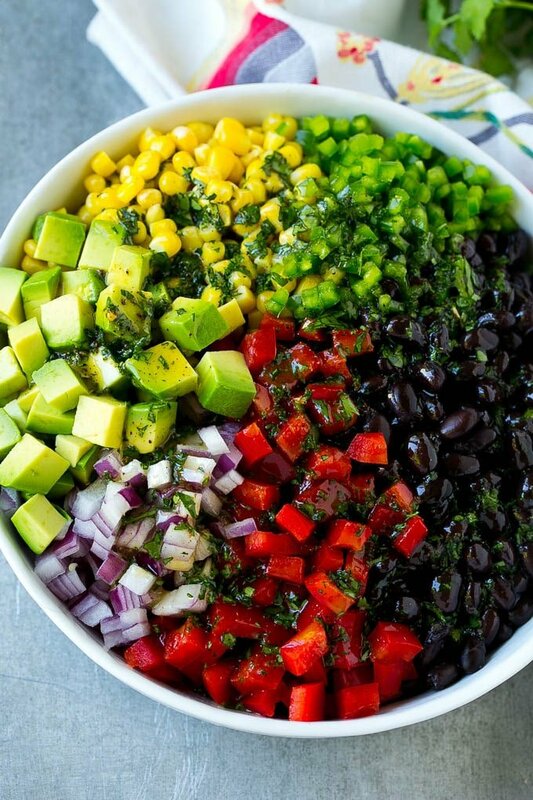 Between the protein in the beans and the healthy fat in the avocado, this is a salad that will keep you full for a long time. I love that this dish is full of so many flavors and textures. Not only that but it’s fresh and healthy which hits the spot for the warmer months. It’s the perfect summer dish because it can become more than just a side dish, it can be anything you want it to be! 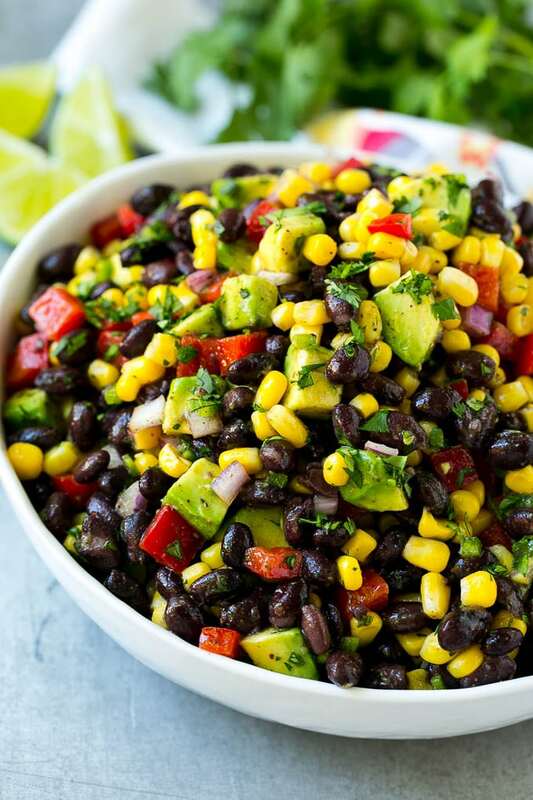 This black bean and corn salad is a fresh mix of black beans, corn, red peppers, jalapeno and avocado, all tossed in a zesty cilantro lime dressing. An easy salad that's the perfect side dish for any meal! 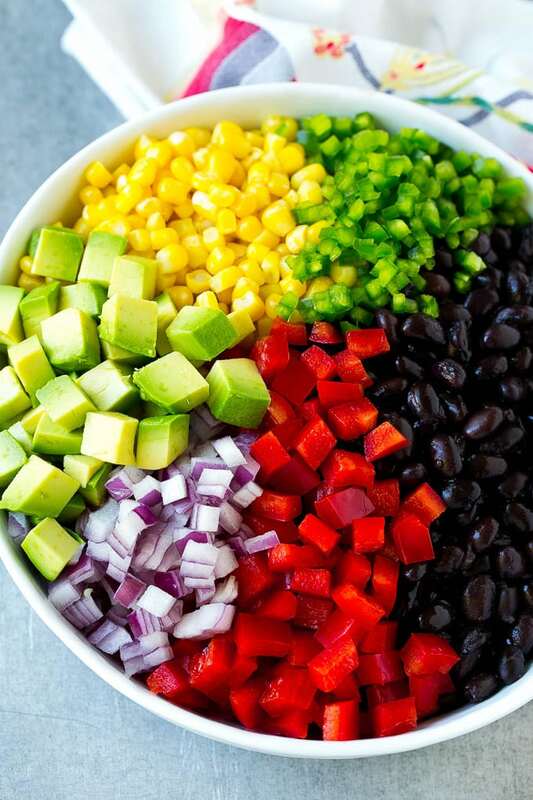 Place the black beans, corn, red onion, red bell pepper, avocado and jalapeno in a large bowl. In a small bowl, whisk together the cilantro, olive oil, lime juice, honey, chili powder, cumin and salt and pepper. Pour the dressing over the beans and vegetables and toss gently to coat. Serve. If you are using frozen corn, how do you prepare? You can just thaw the corn in the microwave then proceed with the recipe! This looks so amazing! I could make a meal of it with some tortilla chips! How much is a serving size? Half a cup? I would never have thought of putting black beans in a salad. Thanks for the inspiration. I love a bean salad, and the fact that its vegetarian is a winner for us. 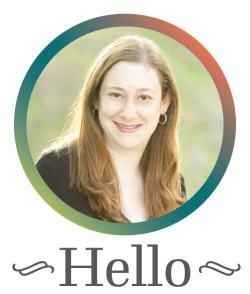 I am going to enjoy making this. I love trying new salsa recipes! I can’t wait to make this one for our next taco teusday! This looks easy, delicious ad healthy– all the makings for a perfect summer meal. Thanks for sharing!!! My husband loves black beans so I am always looking for a new way to make them. I have to give this a try.